High-performance Modular Managed Switch FoxGate E908 chassis based with 10 line-card slots. Can be equipped with 2 management cards and 8 short or 4 long business cards. Depending of network requirements, cards can be equipped with different numbers of ports. 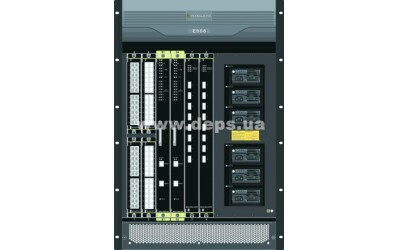 Modular Managed Switch FoxGate E908 has redundant power supplies, ventilation and managment modules. This ensures continuous operation and full system redundancy. All cards are hot-swappable, that allows to add or change them in real time without service interruption. High reliability and flexible management of the ports allows us to recommend this switch to use at kernel-level and in the corporate and carrier networks, distributed LANs. FoxGate E908 supports up to 32 (4 * 8), 10 Gb ports or 192 (48 * 4) Gb ports, thus providing flexibility and high port density. 10G modules can be connected to the L3 and L2 switches at the distribution level, which, prevents delays and packet loss. Master-slot updates automatically the firmware and configuration on the slave slot. Protocols supportMPLS, L3 MPLS-VPN/VPLS and MPLS-TE/FRR, allows traffic transfer ofIP-packets, SDH frames and Ethernet. RIP and OSPF provides dynamic routing, and exchange routes with other L3 switches or routers. High reliability, provided by redundancy of backbones (STP, RSTP,MSTP), routers (VRRP) and by the trunks organization for fast network performance recovery after accidents on backbones. MRPP (Multi-layer Ring Protection Protocol) support provides a rapid recovery of channels at different levels. This protocol provides faster convergence, easier route calculation than STP, which improves the reliability of Ethernet networks.